Usher said, “I have someone on my team that is so similar (to DeShawn), I want to hold my steal for the undeniable”. From THE VOICE season 6 episode 7, Photos, Coach’s Comments & More. Pictured: Biff Gore’s high-kick admired by Blake. 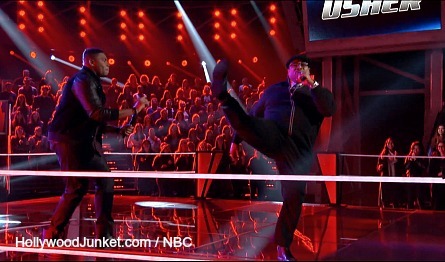 Host Carson Daly said it was a “textbook Voice battle.” Blake asked Biff who was doing high-kicks throughout the battle, “Where did you learn those kicks from?” Adam labeled one of Biff’s moves, “That’s “the Biff.” He was referring to when Biff squatted and rose-up. Usher said he picked T.J. because he was relentless. “I want a fighter on my team” said Usher. As Biff was about to leave the stage, Blake pushed his button to steal him. Usher ran over and hugged Blake. “Man, did you see the room? You are a great entertainer.” Blake also said, “That guy is a once and a lifetime artist. Why wouldn’t I want the chance to mentor him?” Blake said he also wanted to work with Biff because of his high kicks. The Band Perry are the advisers for Team Blake. “You guys are so good, I had to get all these mentors involved” Blake joked. Blake called it his “young country battle”. Jake is 17 years old and Lexi, a senior in high school, is also 17 years old. Miranda Lambert is the “secret weapon” adviser for Team Shakira. Dani works in public relations but believes in following her dream. DeShawn went to college for one semester then left to help his family financially. Shakira chose to pair the two because DeShawn is a pop artist. “Dani can hit the big notes with conviction” said Lambert. During rehearsal, they stepped on each other, and Shakira told them out-singing each other is not the thing to do. Shakira said, “DeShawn is so special, so unique. This is going to be one of the most difficult battles.” The last piece of advice Shakira gave her battle duo was for DeShawn to be himself and for Dani to use her “chest voice”. Shakira said she has a weakness for DeShawn however she thinks Dani has grown so much and see a fire in her. Shakira picked Dani because she said she thinks she can do more with her. Shakira said she was upset that no one stole DeShawn Usher said, “I have someone on my team that is so similar (to DeShawn), I want to hold my steal for the undeniable”. Kat is a former rocker turned nanny. She had three coaches turn their chairs for her. Patrick is from a musical family that has inspired his career goals. He got two coaches to turn for him during his blind audition. They are singing a song performed by Kenny Loggins and Stevie Nicks. Adam said he likes the fact that it’s classic duet. Aloe said to Kat “right now, you can get the notes wrong, but let us hear it so we can tell you what you’re doing wrong.” He said Patrick’s voice is like a “bear”. Shakira said, “I found your delivery Kat really great. Patrick you have one of those voices that seems timeless to me.” She said she’d pick Patrick as the winner of the battle. Adam said “Kat demands a room very strongly and I had to hold on to her.” Shakira said she decided to steal Patrick for three reasons- because he’s so good! This Battle Will Be Epic! Sisaundra is a single mother of three and a former back-up singer for Celine Dion. Paula is out to get her second chance in the music industry as well and once had a recording contract. Shakira said, “Sisaundra, that high note was incredible and you reserved it for the right moment.” Adam told Blake, “They’re on your team! That’s so bazaar!” Blake said, “One of my favorite things about the high note is that you picked that note and that was amazing. You (Usher) mentioned a pitch thing, if it’s not re-occurring I don’t catch it,” and told Paula that she fell out of the pocket and pushed Sisaundra back a little. Unfortunately, Paula left the stage with her head held down as if she had just lost a real physical boxing match. Pulling Out the Rihanna Card! 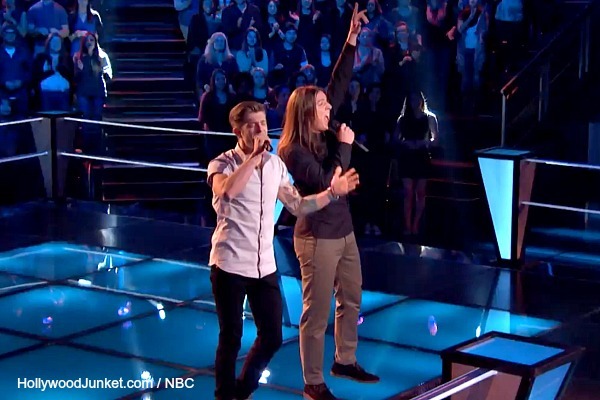 Bartender Jake performed for the first time ever on “The Voice”. He got three coaches to turn their chairs. Stevie Jo is attending college on a theater scholarship. He said he gravitated towards soul music. Stevie Jo came from metal and transitioned into R&B. Jake was excited to be mentored by Jill Scott and Usher. Usher said, “I need them to stretch out of their own comfort zone,” which is why he gave them Steve Winwood’s “Higher Love” song to battle with. “Jake has a Justin Timberlake thing going on. Stevie Jo has so much passion,” said Scott about the two. Shakira said, “you guys just drew us in. It was just so well executed.” She said she’d pick Jake. Adam said, “I thought it was so excellent. Here’s the good news, you’re both going to make it because whoever he (Usher) doesn’t take, I’m going to.” Adam decided to keep quiet about whom he thought won the battle because he is preparing to steal. Blake said, “I never saw a more evenly matched battle.” He said he’d go with Jake. Usher said, “Jake this was your first time on the big stage. And Stevie, no one hit their button but me.” Usher said in all of his time on “the Voice” picking a winner has never been this hard. Adam and Shakira both hit their buttons to steal Jake. Then Blake hit his button while Adam was arguing with Shakira on who hit their button first. Jake said “thanks for keeping me another day.” Shakira bribed Jake by telling him she can introduce him to Rihanna. It didn’t work because Jake went with Team Adam. Adam said he has big plans for Jake. Adam told Jake that there’s no one on his team that is like Jake and he would have had a heart-attack if he had chosen Blake! Watch THE VOICE season 6 episode 7 “The Battles Premiere” first aired by NBC on Monday, March 17, 2014. This full episode is now available at HOLLYWOOD JUNKET until 06/19/14 courtesy of NBC. ENJOY!